The K5 Knightscope stands 1.5 meters tall (4 feet 11 inches) and travels around on wheels -- something that led the company to promote it to reporters as "a mashup of Robocop and R2D2." Like its fictional parallels, the K5 is packed with gadgets: There are several cameras to provide an all-around view day and night, a laser imaging sensor that maps an area in 3D, a thermal imaging system, and facial and license plate recognition systems. An air particle sensor is planned for the future. Knightscope's chairman and CEO, William Santana Li, said his inspiration for the K5 came from the Sandy Hook school shooting in December last year, and a realization that more can be done to prevent similar massacres. "Here in Silicon Valley we have a massive amount of technology, and we believe that with a combination of hardware, software and community engagement we can give the community and the authorities and private security firms a new level of technology that we call 'security 3.0' -- a combination of humans, robotics and intelligence," he said. The idea is to have K5 robots patrolling areas such as parking lots, shopping malls and schools, constantly on the lookout for anything out of the ordinary. It will scan license plates and faces and check them against law enforcement databases, while social media sites are checked for keywords indicating possible crimes. 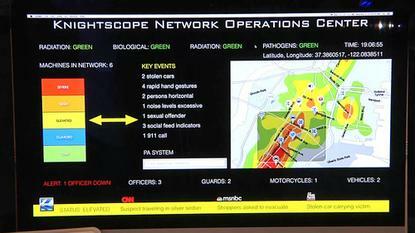 A mock control center displayed the data it might generate: "2 stolen cars, 4 rapid hand gestures, 2 persons horizontal, 1 noise-level excessive, 1 sexual offender, 3 social feed indicators, 1 911 call." But it's debatable whether such a robot and the accompanying security system could have prevented the Sandy Hook shooting or any one of the mass killings that occur in the U.S. every year. Many are perpetrated by unstable individuals who act without warning. And then there are the privacy concerns. "Perhaps the biggest issue with the K5 is the potential for persistent surveillance," said Jeramie Scott, a national security fellow at the Electronic Privacy Information Center (EPIC). "Automated surveillance, facial recognition and license plate recognition in public makes us all suspects. The K5 could become like a cuter, less aggressive terminator that kills privacy instead of people." Scott said there are questions surrounding the collection of biometric data, such as that from facial recognition, and how it's stored, especially if that also includes time and location data. Operators would need to be transparent about that, he said. "Are they going to sell the data and will the government have easy access to it to bolster its own biometric databases, like the FBI's Next Generation Identification database? Greater transparency is needed from Knightscope and similar companies less we get a repeat of the Google Street View issue where the Street View cars surreptitiously collected Wi-Fi data." Li, the robot's inventor, said people shouldn't be afraid of the technology. "Fear doesn't actually create anything," he said. "What can save lives is technology. What we want to do here is to give the opportunity to crowd-source security. So let's say we're going to push a red or yellow alert that there is something wrong in the environment; we're actually going to livestream all of the data coming out of the machine for everyone to see." Knightscope will show the robot in public for the first time Thursday at an event at Plug and Play, a tech accelerator in Silicon Valley. Not surprisingly it is bullish about its potential. The company has beta testers lined up in both the public and private sectors and tests will begin next year, Li said.